"I am so proud of our brother Tiger Woods who has finally seen the light and come to his senses. Here he is in the arms of a strong black woman who understands his struggles and who will truly love him for who he really is - a black man." "Quite often we see the all too tragic tale of black men whenever they achieve fame and fortune who go for white women who are typically easy and submissive and who will go with any man as long as his price is right. These white women love to claim that it is not about color for them. But we all know what color is always on their minds - green." "No white woman will ever truly understand the black man as we black women do. Black women typically have a sixth sense that no other woman on earth possesses. How can a white woman understand our brothers? Does she also experience the racism that he experiences on a daily basis living this oppressive country? Will she be pulled over in her vehicle and shot by a trigger-happy police officer only because her skin color is different? Will she be denied a job when a company goes through her resume and sees that her name is Becky Hillstrom or whatever typical white girl name she has?" "What about when children result from these types of unions? Can a white mother like Elin really teach Sam Alexis and Charlie Axel what it's like to be black in America - a country founded on racism? Has she ever taught them about the racism that they will inevitably experience from people who look like their mother and their maternal grand-parents? Will she teach them about black historical heroes like Dr. Martin Luther King Jr., Malcolm X and Nelson Mandela? Does she even know who these people are?" "Tiger must be congratulated once again for this courageous thing that he has done and I can guarantee that he will be very happy now. A brother only has true happiness when he is with a sister." 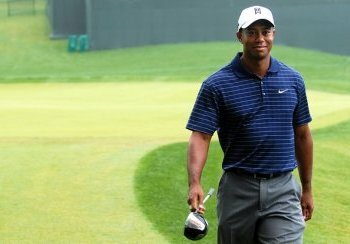 "But Tiger and his ebony queen must still be careful though, because there are millions of Elin Nordegrens and Lindsey Vonns out there who are conspiring, even as I write, to break up this happy relationship." Sweet write up, but marred by superficial errors that make the majority of it barely readable. :(.